We supply a range of Bosch Alarm System packages that will suit both small and large installation requirements. These 844 kits have 4 zone inputs for small houses, apartment units, and small businesses. They offer reliable security that is simple to operate. The Bosch 844 systems monitoring abilities include self-monitored domestic dialling and control room monitoring. This alarm system can have a generic GPRS/GSM mobile dialer installed with it for wireless monitoring. The 844 doesn't offer Smartphone app connection. Bosch's 880 alarm kits have eight wired zones and are the standard alarm equipment for average sized homes and businesses. They have the same monitoring options as the 844 kits. The Bosch Solution 880 panel is wirelessly capable if connected to another wireless receiver. This alarm system can have a generic GPRS/GSM mobile dialer installed for wireless monitoring. I should note this generic gsm only supports domestic dialling for self-monitoring or Contact id for control room monitoring. The 880 doesn't offer Smartphone app connection. 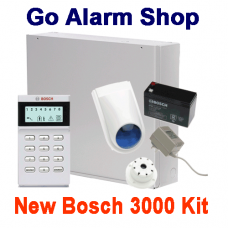 Our Bosch 2000/3000 alarm system kits are Bosch's latest new product release. These kits are eventually going to replace the 880 and 844 panels as they offer more reporting options, particularly regarding the switch over to the National Broadband Network. The big difference with these kits is they support a new LCD Graphic Keypad and LCD touchpad that Bosch have designed. The standard package supports domestic dialling and contact id monitoring for control rooms over a PSTN phone line. There are modules available for the 2000/3000 that offer GSM monitoring "no smartphone app available for GSM", IP monitoring "for a broadband connection", and Smartphone alarm control for Android or iPhone. The Bosch solution 16i alarm system supplies reliable security. It supports 16 alarm zones and low-level access control. The 16i panel is the best option for large houses and medium-sized businesses. The 16i supports email, Text messaging and contact id control room monitoring over PSTN phone line. I should note that the Text messaging monitoring option this panel provides may become obsolete with the introduction of the NBN. Bosch's Wireless system has a unique encryption protocol that ensures hackers can't access the system. The wireless receiver has excellent range qualities that I consider the best in the market. The wireless alarm devices are well designed and operate beyond expectations. The 880 wireless kits can support up to 16 wireless zones in total if there are no wired zones. 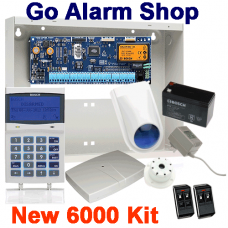 The 880 Wireless Alarms kit is suited to medium sized two-story homes and business installation. The 880's Monitoring options include domestic dial self-monitoring. And contact id control room monitoring. This alarm system can have a generic GPRS/GSM mobile dialer installed with it for wireless monitoring. I should note that it can only support domestic dialling for self-monitoring or Contact id for control room monitoring. The 880 doesn't offer Smartphone app connection. 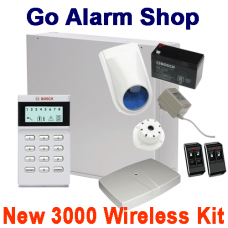 The Bosch 3000 wireless alarm system kit is Bosch's latest new product release. These kits supply up to 16 wired or wireless zones. The 3000 matches the 880 as far house and business types security requirements. The big difference with the 3000 kits is they support a new LCD Graphic Keypad and LCD touchpad that Bosch have designed. The standard package supports domestic dialling and contact id monitoring over PSTN phone line. 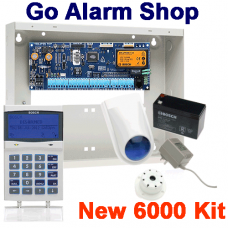 There are modules available for the 2000/3000 that offer GSM monitoring "no smartphone app available for GSM", IP monitoring "for a broadband connection", and Smartphone alarm system control for Android or iPhone. The Bosch solution 16i wireless alarm system supplies reliable security. It supports up to 16 wireless alarm zones and low-level access control. Making it a perfect option for large two-story houses and medium-sized two-story businesses. The 16i supports email, Text messaging and contact id control room monitoring over PSTN phone line. I should note that the Text messaging monitoring option the 16i provides may become obsolete with the introduction of the National Broadband Network. We supply the complete range of Bosch alarm keypads they have manufactured code pads that suit many installations and functional requirement needed. There are two LCD icon keypads that we sell for the alarm kits. The standard code pad that comes with these kits supports 8 zones. There is a 16 zone keypad available for the solution 880 panels that you use if you want to install a wireless module to have a combination of wired and wireless zones that exceed eight areas. There is also a night arming station available for these alarms that are used to arm the home or stay area for invasion protection. The Bosch 2000/3000 alarm system keypads are Bosch's latest new product release. These code pads being Graphic display with full-text functionality are comparable with other supplier's keypads. They offer stylish design and functionality with four new models a standard code pad that looks like the solution 880 code pad, an LCD graphic text code pad that provides ease of use and two new modern designed LCD touchscreen code pads. The 16i keypad is easy to use and operate it can be challenging to program through the keypad due to the installer needing to learn the icon text descriptions. There is a night arming station available for the solution 16i panel. The 16i panel does have a keypad with a prox reader in it for alarm and access control. The 6000 alarm code pads are durable and have full graphics text displays. Functionally and visually they are excellent for secure installation. The 6000 panel also has some outdoor stainless steel keypads for alarm and access control. There are also code pads available with prox readers and night arm stations for home invasion protection. Bosch supplies the complete range of wireless devices for their alarm kits. The Bosch wireless encryption is unique and has excellent defence from hackers. Bosch manufactures three models of wireless movement detectors. They have a standard model 12m x 12m coverage, a curtain detector 1.5m x 12m designed for long thin detection zone and a radio Tri-Tech PET Immune 11m x 11m coverage intended for harsh environments. There are three wireless reed switches available. A standard surface mounts wireless reed switch, a concealed reed switch designed to insert into the window or door frame and a surface mount reed switch that has external contact inputs on it that will allow the installation of a third party wired reed switch. We supply two types of Bosch remote controls. The Radion remote is a solid plastic key fob that has four buttons, two buttons for alarm control and two buttons programmed for other functions like garage door operations. The second is a stainless steel model with the same amount of buttons and the same functionality. Wireless smoke detector explicitly designed for the Bosch wireless system. Wireless glass break detector explicitly designed for the Bosch wireless system. This section contains hard-wired modules available for our Bosch alarm kits. These modules are mainly for input-output expansion, monitoring and access control. If you're looking for hard-wired detectors, reed switches, smoke detectors, etc., you will find them under the accessories section of our website. We can supply and fit any of these Bosch Alarm System kits for sale on this site in Sydney, Illawarra .and the Southern Highlands of NSW. To find out more information on the installed prices of these Bosch alarms. Follow the link to our installation website. Use our streamlined checkout process to design and purchase this Bosch 2000 alarm system. The proces..
We have set up this build your own system options process for the Bosch 3000 wireless alarm system t..
We have set up this build your system options process for the Bosch 3000 alarm system to streamline ..
We have set up this build your system options process for the Bosch 6000 alarm system to streamline ..
We have set up this build your system options process for the Bosch 6000 wireless alarm system to st..